It’s your money, find out how it is being spent. PennWATCH lets you keep tabs on the state budget, spending, revenue, employees and performance – all in one website! Starting from left Tom Curtin DRIVE Rep, 384 Pres. Mike Bonaduce, UPS pre load Steward Mike Domalesky and BA Steve Gallagher doing DRIVE at UPS Willow Grove, Pa. 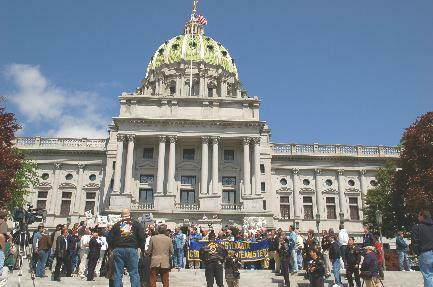 Brother Mike Clark will be working with the PA Conference of Teamsters affiliates on the DRIVE 2012 Campaign. It is imperative we work along side Brother Clark to build our DRIVE Fund so we can combat anti-union legislation and elect candidates that will stand up for working families. The 2012 General Election will be the most critical election labor has ever been involved in. If we fail to elect candidates that support labor’s issues and working families, we will be responsible for setting labor back 100 years. Stand up and fight-the-fight. DRIVE will be our first line of defense and will need all our boots on the ground getting the vote out. Your contributions to DRIVE will not only support the Teamsters in combating big businesses anti-union agenda, but will help in protecting our jobs and fair wages. SIMPLY CLICK ON THE LINK BELOW AND PRINT OUT THE NATIONAL FORM. IT ONLY TAKES A FEW MINUTES TO FILL OUT THE FORM AND MAIL IT OUT. THE NATIONAL FORM CONTAINS VOTER REGISTRATION RULES AND REGULATIONS FOR EACH STATE AND TERRITORY. STATES DO NOT USE YOUR VOTER REGISTRATION TO PICK INDIVIDUALS FOR JURY DUTY-THEY USE YOUR DRIVER AND VEHICLE REGISTRATION. SO THERE IS NO EXCUSE NOT TO REGISTER TO VOTE! You can click on logo at left to enter the Federal Election Commissions full site.